It took them just a snap to mark their name in the K-pop industry. They might be young but the growing popularity of the most sought K-pop boy group Bangtan Seonyeondan (방탄소년단), popularly known as BTS, has skyrocketed Korea and the world’s music charts. A.R.M.Ys, fan club name of BTS, go wild once again as the seven scouts set the stage on fire with their fresh vocals and powerful performances last July 30 at SM Mall of Asia Arena. Afterwards, the members gladly greeted the audience and introduced themselves. Then they proceeded with their performances including the heartwarming songs “Fallen Leaves”, “Tomorrow” and “Butterfly.” A short break took place where they expressed how they missed their fans in the Philippines. 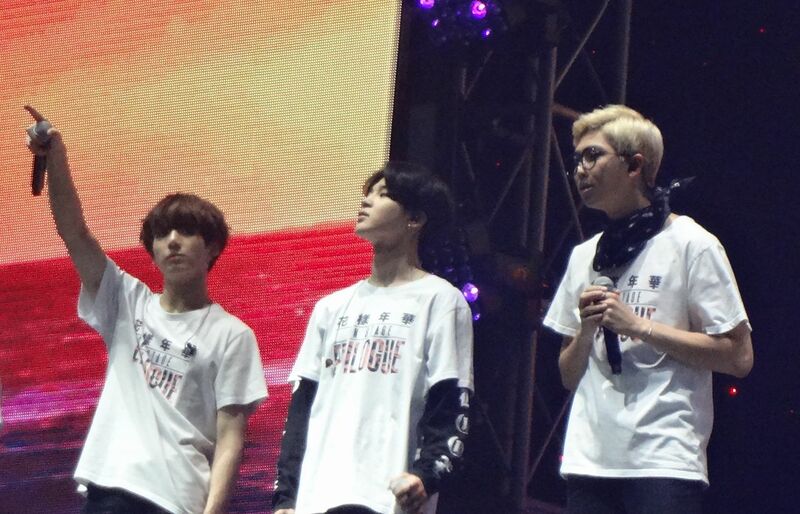 Two years ago, BTS held their “Red Bullet” tour at SM Mall of Asia Arena. Giving the fans a time to breathe after all the moment of excitement, a part of ‘The most beautiful moment’ behind the scenes and interview was showed. ‘Save Me’ performance immediately followed. The heat is on when BTS danced into ‘Fire’ and even the fire effects from the stage simply jives on its beat. Following their set of songs are “Hip Hop Lover,” “We are Bulletproof Pt. 2,” and Cypher Pt. 3: Killer.” They also posed for some cute aegyos and showed a few moves that proved they are pros in dancing. The tear dropping and picture perfect scenario can be seen when the audience instantly turned into a huge message board after they raised red and white papers forming the Korean characters *Gomawo* (Thank you) and *Saranghae* (We love you). The most heartwarming moment occurred when the loud fan chants for the encore ‘I need U’ happened while everyone is passionately singing the song without background music. Waving everyone a goodbye, BTS promised to see their fans again next time for another concert. Also, to show their gratitude to their fans, the concert concluded via video message from the group thanking their most beautiful A.R.M.Y for giving them much support and love all throughout their tours, events and promotions. BTS is a group to keep an eye on, most especially to young and young at heart. It would be tough to beat this phenomenal group for as long as they continue to share their stories, happiness, dreams, and hopes through their music. To wrap it up, See you again in 2017!